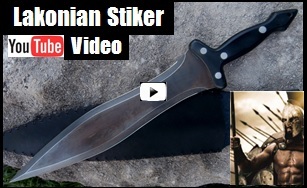 Lakonian Striker Sword. See Pictures, Prices, and Descriptions. Made by Scorpion Swords & Knives. The design of the blade shape originated from the ancient Greeks. The Lakonian (also called Xiphos) was a secondary battlefield weapon for the Greek armies after the dory or javelin. The leaf shape design lends itself to both cutting and thrusting.